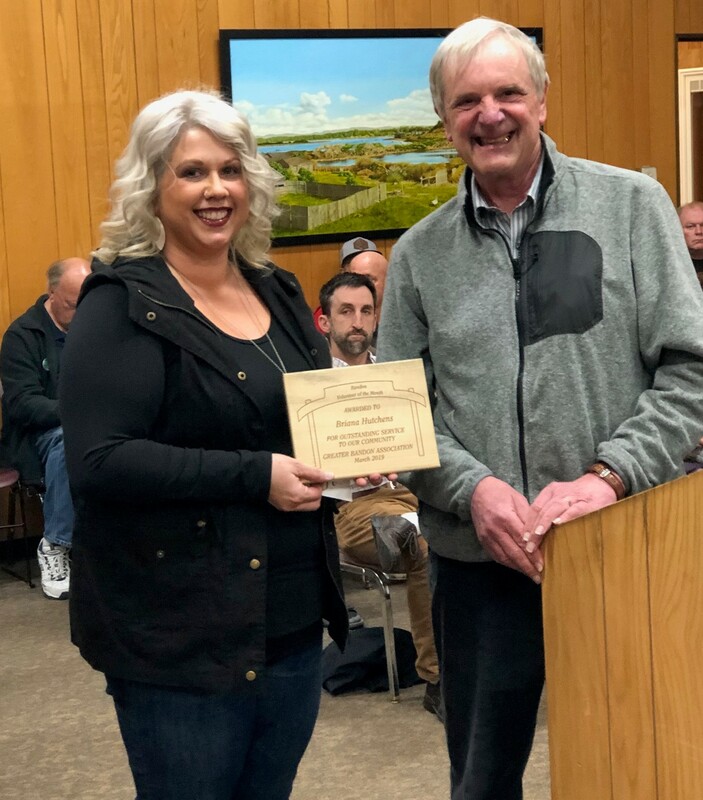 Briana Hutchens was recognized by the Greater Bandon Association as Bandon’s Volunteer of the Month at the March 12th meeting of Bandon’s City Council. GBA presents this award to one the many outstanding individuals that contribute to making Bandon a better community to live in. Briana was presented the award in form of a plaque and a gift certificate from Bandon Brewing Company. Briana has been President of the Bandon Booster Club for the last three years. These volunteers help make extracurricular activities happen for Bandon’s students. They raise funds through concession stand sales and their Gold Rush fundraiser which brought in $18,000 this year. Their funds support all three schools like water fountains in the elementary school gym, new mats in the high school gym and uniforms and equipment for the middle school teams. They also provide a scholarship to a Bandon High School graduate each year. The Greater Bandon Association will be honoring one of Bandon’s many volunteers that are making a difference in the community each month. Nominations for the May award should be e-mailed to harv@greaterbandon.org or mailed to P.O. Box 161 by close of business on March 22nd.